The Reports tab allows you to run and view NMVTIS, CARFAX and AutoCheck vehicle history reports, and suppress the report or the link to order the report if you so choose. NMVTIS Reports can be processed from this tab. Click the Purchase New NMVTIS Report button to run a report. 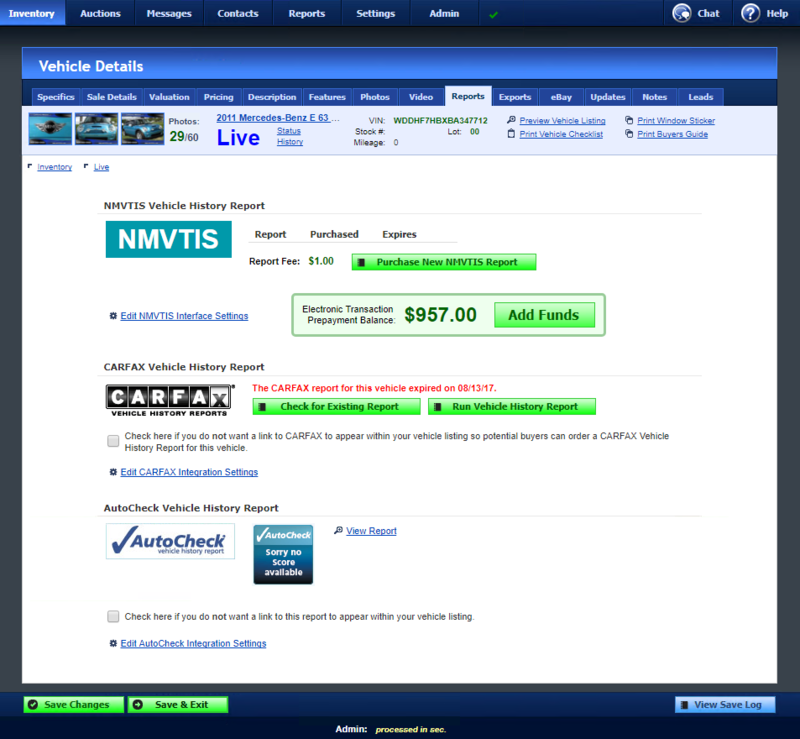 You are able to display CARFAX Vehicle History Reports in your vehicle listings if you are a registered CARFAX dealer, you have enabled CARFAX integration in your settings, you have run a report for the VIN, and the vehicle qualifies for the CARFAX Buyback Guarantee. If you are not a registered CARFAX dealer, you can Apply to become a CARFAX Certified Dealer. If you are a registered CARFAX dealer and you have enabled CARFAX integration in your settings, you can run CARFAX reports for your vehicles directly from WebManager, or check for existing reports if you have already run them through the CARFAX website. If you’ve run a report for a VIN through the CARFAX website, you can click on Check for Existing Report to retrieve the report information. You can also click on Check for Upgraded Report if you’ve run a more comprehensive report than the one shown in WebManager. To run reports through WebManager, you can click on Run Branded Title Check, Run Vehicle History Report, or Run Consumer Info Pack, depending on the default report type you have selected in your settings. Click on Edit CARFAX Integration Settings to change your default report type. You can also upgrade an existing report to a Vehicle History Report or a Consumer Info Pack. To view the report, you can click on View Report. If you are a registered AutoCheck dealer and you have enabled AutoCheck integration in your settings, you can run AutoCheck reports for your vehicles directly from WebManager. AutoCheck doesn’t provide a mechanism to check whether you’ve already run a report for a particular VIN from the AutoCheck website, however, running the report from WebManager will not incur a new charge if you have already done so. Click Run AutoCheck Report to run the report. It is possible to configure WebManager to run AutoCheck reports for all of your vehicles in WebManager automatically. When this option is enabled, WebManager will run AutoCheck reports for your vehicles immediately as they are added to the system, and any time they are viewed either in the control panel or on your website. Because of the way AutoCheck’s pricing is structured, this may add up quickly if you are not on an unlimited plan and you have a lot of vehicles. You should exercise caution before choosing this option and understand how it may affect your billing. Click on Edit AutoCheck Integration Settings and check Run Reports Automatically if you want to enable this option. You can also display Pre-Owned Certification information for your vehicle by checking the Pre-Owned Certification checkbox. This will display information about the manufacturer’s Pre-Owned Certification program within your vehicle listings.